The Miami Heat’s nine-game win streak is an indicator that Eric Spoelstra’s philosophy is working, as it is maximizing a very unspectacular group of players. The Miami Heat were a team that looked dead and buried with an 11-30 record, but they now find themselves just three games back from the eighth-seeded Detroit Pistons. While the Heat may not have been expected to make the playoffs, it has become a potential reality, as this team is playing better basketball than all the other “middling” teams in the Eastern Conference right now. Defensively, the Heat have been a well-coached unit all year as they rank sixth in defensive efficiency, and fourth in opponent field goal percentage. They have a lot of young, driven players who are capable of getting to the perimeter quickly and closing out three-point shooting, and Hassan Whiteside is thriving in his role as the interior protector. The major difference in their winning run has been the outside shooting, which has simply exploded. In their first 41 games, the Heat were shooting 33 percent from downtown, yet in their winning run, they have shot 42 percent from beyond the arc. The Heat’s win over the Hawks was oddly the one in which they recorded their lowest three-point percentage as a team, but it was clear that the fear of the outside shooting from an Atlanta point of view opened up driving lanes for the likes of Goran Dragic and Dion Waiters. There was also more space inside for Hassan Whiteside, who had one of his best games of the season totaling 18 points, 18 rebounds and two blocks. Miami’s outside shooting has improved so much that teams are naturally closing out quickly. If a defender bites on a pump fake against the Miami offenae, then the results can be disastrous, as all of their guards are trained to dart to the perimeter in such a scenario. Eric Spoelstra’s Miami Heat philosophy has always been based on unselfish play involving a lot of ball movement. His and David Fizdale’s offence wasn’t a pace offence, but more a five-out style offence that required at least four of the players on the court to be comfortable playing from the outside. Many questioned whether Spoelstra’s philosophy would work after the departures of LeBron James, Chris Bosh and Dwyane Wade, and to a certain extent, Spoelstra’s skeptics will have felt validated after the Heat’s terrible 11-30 start to the season. However, in this winning run, the major takeaway for Heat fans is that Eric Spoelstra’s philosophy works well, and is a system that can turn average players into effective ones. Outside of Goran Dragic and Hassan Whiteside, this is a roster of journeymen and young players from the second round and the D-League. Although a player’s roots do not determine their ability, this Heat roster is lacking in experience when compared with many other middling Eastern Conference teams. Take Dion Waiters for example, a player with a reputation as a draft bust, who could only earn a two-year, $6 million deal despite being a relatively important part of the Thunder’s conference finals team. He was a player who didn’t draw any kind of a bidding war, but Spoelstra and Pat Riley took a chance on him, and he is thriving in Spoelstra’s system as he isn’t being asked to do too much. 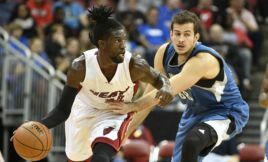 Spoelstra appears to have found the right balance between giving Waiters responsibility but not forcing him into bad situations. Waiters is perhaps best known for nailing the game-winner against the Golden State Warriors, but he has done more on this winning run than hit one single shot. He has averaged 22 points, 4.5 assists and 0.5 steals per game, and he has recorded an overall plus-minus of +67. Waiters was playing relatively well up until this point, but he has exploded in the last nine games, and one has to wonder whether he is capable of keeping this up. Waiters defense has also been impressive, as in the last nine games, he has only allowed his opponent to shoot 38 percent from the field on 11 attempts per game. As a member of the Thunder, he allowed his opponent to shoot 43 percent from the field and while this isn’t terrible, it is clear he has vastly improved as a member of the Miami Heat. His game against Atlanta was the most well-rounded game of his season as he scored 20 points and grabbed seven boards, while also contributing with two blocks, three assists and two steals. Until his display against the Atlanta Hawks, Waiters had never had a game where he managed 10 points, five boards, two assists, two steals and two blocks. This shows that since his arrival in Miami, Waiters has become a team-first type player, as opposed to a volume shooter like he was in Oklahoma City and Cleveland. During the third quarter of the Atlanta game, there was a 10-second spell where Dion Waiters recorded a block, a steal and a layup. While this detail may seem irrelevant in the grand scheme of things, this short spell showed just how far Waiters has come under Spoelstra. He defends well, plays hard, and makes good basketball decisions for the good of the team, rather than trying to play hero-ball. Waiters is averaging more isolation attempts per game this year, but this is largely because he is taking on a bigger role in the Miami Heat offense. He is in the 54th percentile on these attempts, which isn’t atrocious, and his field goal percentage, three-point percentage and assists per game have all improved since last year, despite the increase in volume. Luke Babbitt is another former misfit who has been impressive over the Heat’s winning run. He has shot 46 percent from beyond the arc in his limited minutes, and he has particularly impressed in the last three games, as he has hit seven of his attempts from beyond. What has been most incredible about Babbitt is his defense. He has moved well, closed out on his opponents and not been the liability he was in Portland and New Orleans. This is a stark indicator of just how effective the Miami Heat coaching staff is. Babbitt has never been a notable defender, as prior to joining the Heat, his average defensive box-plus minus was minus-2.1. Although he still isn’t a positive defender, he isn’t a liability anymore, and his excellent coverage of Paul Millsap best summed up his revival in South Beach. This might be one of Eric Spoelstra’s finest pieces of coaching, as he has turned a defensive liability into a hard performer. Eric Spoelstra’s overall goal will have changed when Dwyane Wade left, as he now wasn’t simply being tasked with winning at all costs. He was handed a roster of misfits by Pat Riley, and he was tasked with trying to milk every ounce of basketball ability out of them. The hope was for some of these players to become key role players in a future championship team as Riley re-stocked through the draft or free agency, and so many of these players have proven their value. The man who deserves credit is Eric Spoelstra, as his system gets good looks for players, and preaches a team style of basketball. 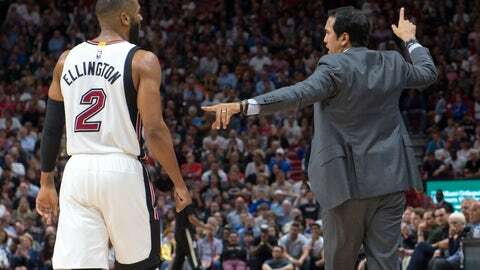 It is no surprise that the likes of James Johnson, Dion Waiters and Luke Babbitt are playing their best ever basketball in Miami, Spoelstra’s coaching is amongst the best in the league. While the Heat’s run pushes them towards the playoffs, the most important takeaway from the entire ordeal is just how good Eric Spoelstra’s coaching is. Any doubts Pat Riley, or Heat fans had about him will have been erased in the past three weeks.